On the eve of an international meeting on “women in power and decision-making” in Santiago de Chile, the Troika+ of Women Leaders on Gender and Climate Change and leaders from local communities met to discuss solutions to climate change challenges. 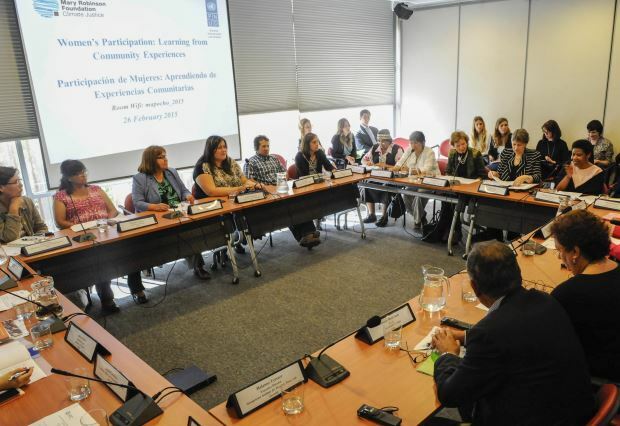 The round table discussion titled “Women’s Participation: Learning from Community Experiences” was hosted by the Mary Robinson Foundation – Climate Justice in cooperation with UNDP and brought together 23 representatives from local communities engaged in climate action from all over Chile, representatives of Chilean local and national government, civil society, business and international organisations in a round table dialogue to exchange experience and knowledge on addressing climate change. Nine representatives from Chilean communities affected by climate change in their daily lives, spoke passionately about their situation, shared insights on their climate change adaptation and mitigation projects, and voiced their concerns and hopes for future generations in their communities. They highlighted the need to protect their fundamental human rights, such as the right to water and the right to food. The local leaders urged international and national policy makers to listen to their voices as they work on climate challenges so that they can understand the issues that they are facing and learn from their experiences and local knowledge. Reflecting on the presentations given by the community representatives, Helen Clark, Administrator of UNDP, said the solutions that had been presented on a most basic of human needs – access to energy – were truly replicable in other regions of the world. As a direct reaction to discussing the issues raised by the local community members, Jara Jimena, Under-Secretary of the Ministry of Energy, Chile committed to engaging with local communities on issues relating to access to sustainable energy to ensure their participation in policy making processes so that their needs are identified and their local knowledge can contribute to the solutions. The roundtable was attended by, amongst others, Troika+ members Phumzile Mlambo-Ngcuka, Executive Director of UN Women, Winnie Byanima, Executive Director of Oxfam International, Melanne Verveer, Executive Director, Georgetown Institute for Women, Peace and Security, and Musimbi Kanyoro, President and CEO, Global Fund for Women, who will amplify the voices of the community leaders in their ongoing work on climate change and sustainable development. Summarising the dialogue, Mary Robinson encouraged all participants to continue the climate justice conversation in their respective platforms; a conversation that promotes respect for human rights and local knowledge, and ensures that women are at the heart of decision making.